Guys, we have HOT news for you in last summer days - the opportunity that just can’t leave you indifferent. From now on one of most popular and effective eCommerce solution for Joomla - HikaShop is in the list of Cart2Cart supported carts. Other words, automated HikaShop migration is launched and you can benefit from progressive marketing tools and powerful statistics of this solution to create successful online store. Don’t waste your chance to try out this combination of simplicity and flexibility and start conquering eCommerce industry now. What is offered by automated HikaShop import via Cart2Cart? Cart2Cart service offers you to transfer to (or from) Hikashop all your eCommerce data in a smooth and secure way. How it will work? All your entities will be automatically moved from one store to another in few hours without affecting your current store performance. That means your customers will be able to make purchases and you can come back to your deals during rapid replatforming. 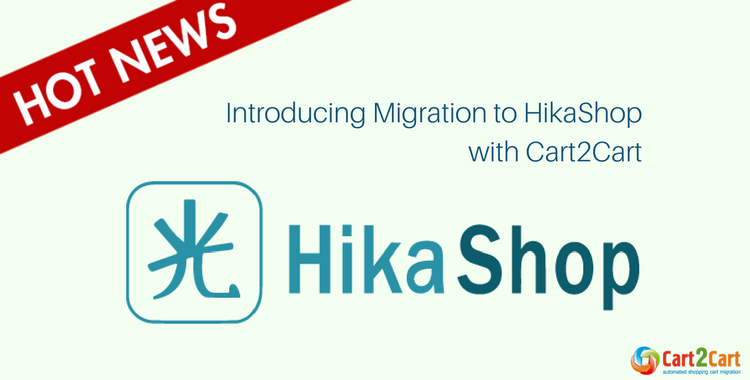 By the way, there is a Free Demo HikaShop migration at your disposal. This option gives you a possibility to testify the service with no charge and check up how your new store is going to look like. Demo data transfer will move a limited number of entities to your desirable store in less than 30 minutes. No worries, in case you will need any help or assistance, our 24/7 support is always there for you. There are also a number of additional options offered by our service. You are welcome to pick them up if wishing to customize your migration. Take your ticket to successful business and perform automated migration to HikaShop right now.